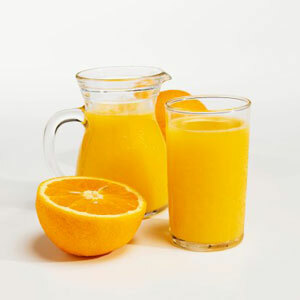 Fungicide in OJ? Now what are we to drink at breakfast?! OK, so now we can’t drink commercial OJ anymore. First it was arsenic and lead in apple juice, now a bad fungicide in orange juice. What the hell is America supposed to drink at breakfast anymore? This fungicide is linked to cancer and infertility. But the FDA assures us it’s only “trace” amounts, so we should be just fine. Well those “trace” amounts of chemicals and toxins in our food, water supply, and environment, start to add up and don’t leave your body so readily…thus the cancer risk. I purchase Trader Joe’s Organic Florida OJ which I found relief in knowing this fungicide is banned in the U.S. Brazil imported oranges and juice is what contains it and the commercial OJ providers like COKE uses it and found it. Wouldn’t tell us if it was in their Simply Orange or Minute Maid brand…and Pepsi won’t admit if they have found it in their OJ brands Tropicana and Dole. You can bet that Pepsi is buying it from Brazil where the OJ is cheaper than Florida grown orange juice.